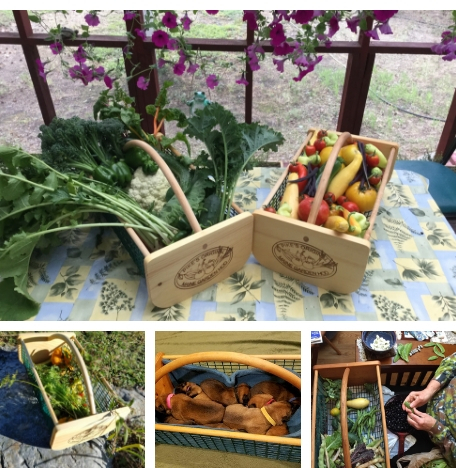 Styled after a traditional clam hod used by New England clammers to hold and clean their catch, Pikes Garden Hod is perfect for harvesting and rinsing off vegetables. Customers are finding new and innovative ways to use their hods, both in and out of the garden. From packing a picnic lunch or picking flowers to carrying kindling or holding towels in your guest bath, they are extremely versatile. Now available with our traditional steam-bent oak handle or our new "soft handle" that swings to the side for easier loading and unloading. Click HERE for some creative ways our Hod Squad members are using their garden hods!